Yesterday, I posted a review of a now “classic” think-like-a-programmer book; Andy Hunt and Dave Thomas’ “The Pragmatic Programmer“. I commented that it was interesting to see this book from the perspective of 13 years later and what was still being practiced actively and where we may have moved on, as well as the suggestions they made to be effective and, yes, pragmatic programmers. To book end this experience, I wanted to look at another title that was in a similar vein, but much more recent, as in this title was released just a few months ago. 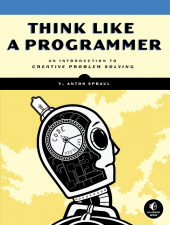 This book, V. Anton Spraul’s “Think Like a Programmer“, covers much of the same ground as “The Pragmatic Programmer”, but does so with a much narrower scope. While “The Pragmatic Programmer” looked to focus on many different aspects of being effective, “Think Like a Programmer” puts the bulk of its energy on one issue; problem solving and the tools necessary to approach problems and develop solutions. The goal of this book is to help answer that age old challenge… I understand the syntax, I can read code, I can modify code, I can work with other people’s code and understand what it’s doing, but when I sit down in front of a blank editor, I’m lost! “Think Like a Programmer” takes the reader down a number of paths to help explain some of programmings more challenging aspects and do so with generally basic coding structures. The entire book’s examples are in C++, so there is a unity to the problems being presented. While the examples are in C++, all but a few of the problems could be ported to other languages like Java, Ruby, Python, etc.. The chapter on pointers might be the sole exception, and the chapter on classes comes from the perspective of a language that can be used with both procedural and object-oriented approaches. I am not a programmer by trade. I did enough C++ programming in college to recognize the structures and the methods used for the solutions, so there was nothing in the code itself that was terribly frightening or all that advanced. Beginners, or those who have never seen any C++ code, may feel a little lost in spots, but Anton takes the time to explain every line. The goal of the book is not to focus specifically on coding syntax, but on the problem solving domain. Getting good and usable code, that’s a definite bonus, and he makes the case for doing all of the things that Andy and Dave talk about in “Practical Programmer”. Seasoned developers may find this a bit basic for their tastes. Rank beginners might find the examples intimidating. Those in between, even those who are not C++ programmers, will likely learn a good deal and help de-mystify a few areas by working through the examples and problems. As a tester, rather than a programmer, I think that these titles are helpful to look at the issues that programmers face, as well as the issues and methods used to solve problems. Since we have to test those solutions, understanding how programmers get there and the tools they use to get there is helpful. “Think Like a Programmer” is a solid step in helping both programmers and testers look at these situations in interesting ways.